Rudy Giuliani was the Mayor of New York City during 9/11, and plenty of Americans remember him as “America’s Mayor” solely due to his stewardship over a traumatic situation. That said, there are a lot of folks who misremember the majority of Rudy Giuliani’s career. This tweet from a political analyst for ABC, CNN and CBS summarizes the false history many pundits have concocted around Giuliani. Mayor Rudolph W. Giuliani’s marital problems exploded yesterday in a public exchange with his wife, Donna Hanover. The mayor abruptly announced that he was seeking a separation from Ms. Hanover, and Ms. Hanover, caught unaware, then said that the couple’s troubles began years ago because of a previous relationship between the mayor and a member of his staff. The next year, on Eighth Avenue in Manhattan, an undercover cop solicited a man named Patrick Dorismond for a drug sale. A fracas ensued, and a different officer shot Dorismond dead. The mayor began by unsealing Dorismond’s police record, to include his juvenile file. The formerly secret documents shed no light on what happened on Eighth Avenue that night. But Giuliani harnessed innuendo, infamously saying Dorismond “isn’t an altar boy”. As it happened, Dorismond literally was an altar boy. When this was pointed out to Giuliani, he said: “I think that’s not a correct juxtaposition of statements, nor intended for any kind of decent or useful purpose.” It would take until May for Giuliani to concede he had made “a mistake”. In 1997, four Flatbush police officers beat and sodomized a Haitian immigrant named Abner Louima in the 70th precinct, tearing a hole in his colon and perforating his bladder. Amnesty International used this case as an example of torture. Louima said at the time that the officers told him, “This is Giuliani-time,” but he later recanted it. Despite it being specifically untrue, that phrase resonated throughout the city amongst minority communities as a representation of the kind of policing that Rudy Giuliani encouraged. The heavy-handedness which Donald Trump implores our police officers to use is simply an extension of actual policy carried out by Giuliani’s New York City government. When Jeff Greenfield laments the disappearance of the “Giuliani who governed 25 years ago,” this is the kind of governance he’s unwittingly(?) endorsing. Rudy’s infatuation with authoritarianism began before his time as mayor. In 1992, Giuliani encouraged a racist mob who had showed up to protest (read: riot) then Mayor David Dinkins’ creation of a civilian complaint review board for police. It was one of the biggest riots in New York City history. As many as 10,000 demonstrators blocked traffic in downtown Manhattan on Sept. 16, 1992. Reporters and innocent bystanders were violently assaulted by the mob as thousands of dollars in private property was destroyed in multiple acts of vandalism. The protesters stormed up the steps of City Hall, occupying the building. They then streamed onto the Brooklyn Bridge, where they blocked traffic in both directions, jumping on the cars of trapped, terrified motorists. Many of the protestors were carrying guns and openly drinking alcohol. Yet the uniformed police present did little to stop them. Why? Because the rioters were nearly all white, off-duty NYPD officers. They were participating in a Patrolmen’s Benevolent Association demonstration against Mayor David Dinkins’ call for a Civilian Complaint Review Board and his creation earlier that year of the Mollen Commission, formed to investigate widespread allegations of misconduct within the NYPD. Newsday columnist Jimmy Breslin described the racist conduct of the “protesters” in chilling detail. It should come as no surprise that literally every single Rudy apologist is white. 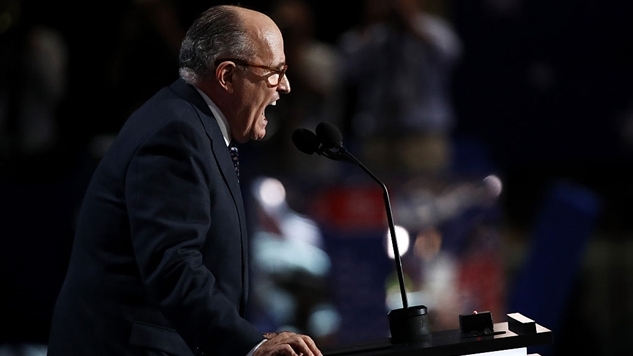 For people who were largely unaffected by Giuliani’s violent police tactics, Rudy is remembered as a man who made comforting speeches in the wake of the largest terrorist attack on American soil. For (nonwhite) people who actually had to live the effects of Giuliani’s decisions, there is no debate as to Rudy’s legacy. He is and always has been a callous monster who encourages violence against minorities. The fact that some (white) people who oppose Giuliani today still lament the demise of “old Rudy” tells you all you need to know about the distressing outsized impact that racism still has amongst non-Trump America.